Rapper Meek Mill arrives at the criminal justice center in Philadelphia, Monday, Nov. 6, 2017. A Philadelphia judge has sentenced rapper Mill to two to four years in state prison for violating probation in a nearly decade-old gun and drug case. 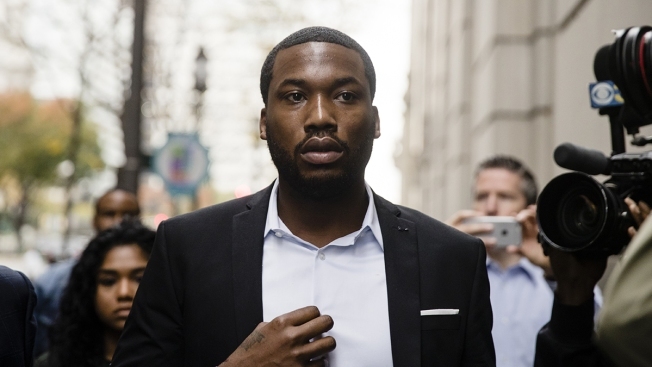 The Philadelphia judge who has become a target after sentencing Meek Mill to prison on a probation violation has hired her own lawyer who's threating to sue for defamation. Attorney A. Charles Peruto Jr. said Thursday that Common Pleas Judge Genece Brinkley hired him last week. He says the rapper's legal team has been making baseless claims to the media about the judge's personal and professional conduct. Attorney Joe Tacopina is representing Mill. He says the rapper's legal team looks forward to Brinkley's defamation suit. Philadelphia-born Mill was sentenced in November to two to four years in prison for violating probation on a roughly decade-old gun and drug case. Mill's lawyers have unsuccessfully appealed the sentence multiple times and have called for Brinkley to recuse herself from the case.